What do you think of when you think of South Africa? For me it’s the Boer War, apartheid, Nelson Mandela and, more recently, the story of Detroit musician Rodriguez and his meteoric rise in South Africa — a story brought to life in the brilliant documentary, Searching for Sugar Man. All those stories were so vivid in my mind, there was very little room for any new information. This trip is an attempt to change that. As preparation, Leroy and I read whatever we could find on the history and culture. For thousands of years before European settlement, the southern tip of Africa was inhabited by the Khoisan people — the San (Bushmen), who were hunters and collectors, and the Khoikhoi (Hottentots), who lived more pastoral lives. Bantu-speaking people also began moving south, adding to the cultural diversity. But it was the arrival of the Europeans in 1652 that almost wiped out the traditional way of life of the Khoisan. It was the all too familiar story of colonisation. Sailors landed at the Cape of Good Hope in 1652, under directions from the Dutch East India Company to construct a fort and plant a vegetable garden for use by ships on the spice route between Europe and the Indonesian archipelago. Along with tools and seeds, the settlers also brought with them European diseases like smallpox, and many of the Khoisan succumbed or were dispossessed of their land. For around 170 years, the Dutch also brought also slaves into the colony to provide forced labour for the agricultural enterprises the free burghers (landholding settlers) were establishing. The slaves were originally taken from other parts of Africa and later India, Malaysia and Indonesia. For some reason I hadn’t realised that the slave trade was interwoven with South African history. Discovering this, it was no surprise to also hear that descendants of these slaves form a large part of the population now, along with descendants of the Afrikaners and English. In 1994, after of decades of international condemnation and internal opposition to apartheid, the African National Congress was voted into power, along with Nelson Mandela. I wouldn’t usually place so much emphasis on the history of a country, but in the case of South Africa I felt it was necessary to try and understand the complexities involved before we visited. To try and understand that when we visit the Castle of Good Hope — a fairytale name for the huge stone fort built by the Dutch East India Company — it’s not just an amazing old building; it’s also a symbol to many of the colony’s slaving past. What’s not evident amongst all that history is that Cape Town is stunning. 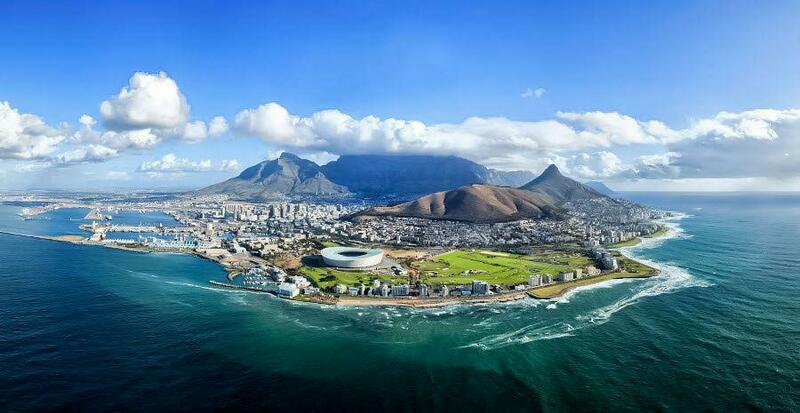 Nestled between the mountains and the South Atlantic Ocean, I’d say it’s right up there with the most beautifully situated cities of the world. Leroy and I are always up for a view and we’d been tipped off by a friend that the cable car ride to the top of Table Mountain would pretty much guarantee us a good one. They were right, as you can see here. We also struck gold with the weather: a predicted top of 25°C and sunny. I could have stayed up there for hours, gazing out of the city towards the sea, but we had places to go and people to meet. Back down at the waterfront, we met up with Liza and Tom. Liza is an old friend of Leroy’s from his New Orleans days, but had returned home to Cape Town around ten years ago. Tom, her American boyfriend, had come along for the ride but loved it so much he stayed on. With their two kids in school and the day off work, they were free to show us around. We caught the first ferry across to Robben Island (Robbeneiland in Afrikaans), a low, flat island in Table Bay that now operates as a kind of living museum. The island had been used as a leper colony and animal quarantine station, and then from 1961 as a jail mostly for political prisoners. Nelson Mandela spent 18 years of his sentence here. It was a distinctly sobering experience wandering around the island graveyard and the old quarries, and visiting Nelson Mandela’s tiny cell. 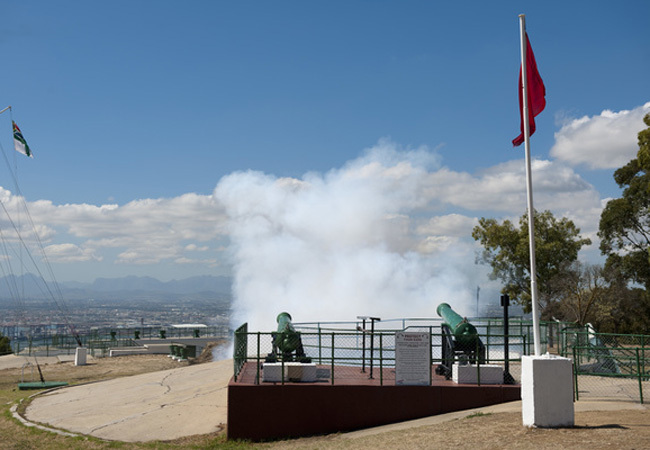 Back in the city, Liza and Tom whisked us up to Schotsche Kloof on the slopes of Signal Hill to watch the loading of the Noon Day Gun, a daily ritual where a cannon is fired by the Navy every day at noon. I nearly jumped out of my skin, even though I was expecting it. By then we decided we were starving, and went in search of sustenance in Bo Kaap, a lively neighbourhood that was once known as the Malay Quarter. During the years of apartheid, the descendants of ‘Muslim-majority’ slaves were segregated into this area of the city and as part of their Eid celebrations at the end of Ramadan, they painted their houses in gorgeous bright colours. The neighbourhood is now a huge drawcard to visitors. We settled on the ‘Cape Malay’ restaurant Bo-Kaap Kombuis and ordered delicious spicy curries and roti to share. On the way to collect the kids from school, and knowing that Isaac and Claudia wouldn’t be particularly interested in looking at plants, we called in to the Kirstenbosch National Botanical Gardens. The gardens, now listed as a World Heritage site, sprawl across the slopes of Table Mountain National Park and contain many rare and endangered species. We didn’t have long to explore, but did get to experience the relatively new Treetop Canopy Walkway and the views from up high. While it was a bit crowded with the kids squashed in to the car with us, the sea views on our right were spectacular as we would our way down the coastal road from Hout Bay to Cape Point Nature Reserve. The drive took well over an hour, with soaring cliffs flashing by my window, and I was very glad I was in the front avoiding any carsickness. I have to say, Leroy looked a little green as we clambered out at the other end and he’s usually pretty good with windy roads. 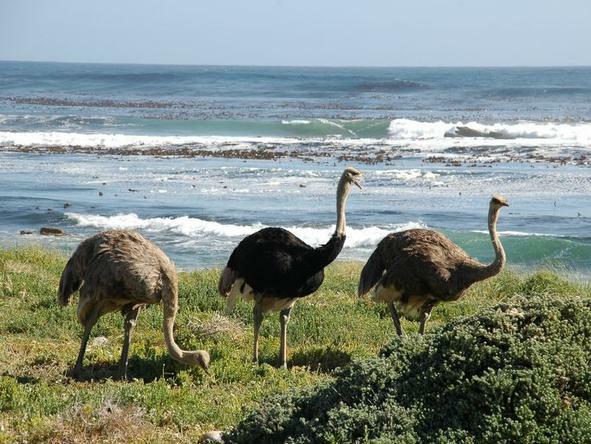 It was hard to believe we were at the famed Cape of Good Hope. Along with plenty of other visitors, we climbed what felt like hundreds of steps up to the lighthouse for more amazing views over the Cape, then headed over to Simon’s Town to visit the African Penguin Colony at Boulders Beach. It’s not as though we don’t have penguins in Australia, but they’re always great to see. I had been super-excited, though, to see ostriches and zebras wandering around in the nature reserve. 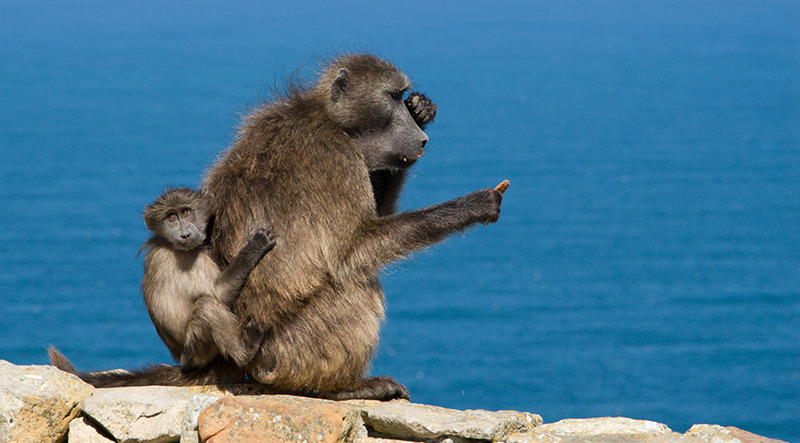 Not to mention the baboons clambering around. We’re on our way back to Bo Kaap now, for an early dinner at Marco’s African Place. Marco was the first black restaurateur in Cape Town, opening his first venue in 1989 and this one in 1997. Liza has told us that it’s a huge 220-seater and that we can expect live music alongside our food. I saw Leroy listening with great interest as Tom described something called the Pan African Platter, which is apparently pan fried fillets of ostrich, springbok and kudu (a kind of antelope). No guesses as to what he’ll be ordering. I think I’ll be going for something a little less meaty; umngqusho (a dish containing sugar beans, butter, onions, potatoes, chillies and lemons) or maybe even ‘Marcia’s Rasta Pasta’. I think we’re in for a fun evening, no matter what.